India (Bharat, Hindustan), South Asia ke ek desh hai. Iski abaadi 1,000,000,000 se jaada hai. India ke raajdhaani New Delhi hai. Is desh ki official bhasa English aur Hindi hai. Ye area me duniya ke seventh sab se bada desh hai aur abaadi mein dusra sab se bada desh hai, lekin duniya ki sab se badi democracy hai. Iske south me Indian Ocean, west me Arabian Sea, east me Bay of Bengal hai. Iske border ke west me Pakistan, north me China, Bhutan, Nepal aur east me Bangladesh aur Myanmar hai. India ke nangich me Indian Ocean me to the east. India nangich me Sri Lanka, Maldives, aur Indonesia hae. India ke naam Indus se aais hai, jon ki purana Farsi bhasa me Hindu sabd hae. Farsi me ii Sanskrit सिन्धु (Sindhu) se aais hae, jisme ii Indus Naddi ke naam hae. Purana jamana ke Greeek logan Hindusani log ke Indoi (Ινδοί), yaaniki Indus ke log, bolat rahin. 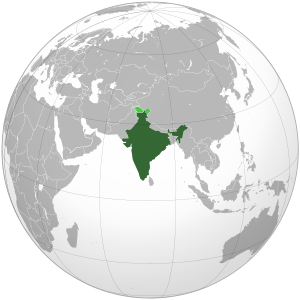 India ke Constittion me des ke Bharat (pronounced [ˈbʱaːrət̪] bola jaae hae. Bharat naam India ke ek purana raja Bharata se ais hae. Hindustan ([ɦɪnd̪ʊˈst̪aːn] , jon ki Farsi se aais hae, ke matalab “Hindu ke des” hae. India ek prachin des hae jiska lamba itihas hae. Adhunik India 1947 me ajaad bhaes rahaa. India ke itihaas uu time se suruu hoe hae jab ki 500,000 saal pahle hian pe Homo erectus rahat rahin, Iske baad hian pe 75,000 saal pahile Homo sapiensrahe ke suruu karin. Indus Valley Civilization, jon ki Indian sub-continent ke northwestern hissa me c. 3300 se 1300 BCE talak rahaa, India ke pahila khaas civilization rahaa. Iron Age me ek Vedic Civilization, Indo-Gangetic plain me suru bhais jisme Magadha kingdom rahaa jon ki Mahavira aur Gautama Buddha ke 6th or 5th century BCE me janam dis rahaa. 4th and 3rd centuries BCE me lagbhag subcontinent ke sab hissa ke Maurya Empire aapan niche kar liis. Iske baad 1500 chhota chhota kingdom, jiske middle ke nnam se jaana jaawe hae, rahaa. Ii time India ke economy jorr se barha rahaa. 4h century me India ke north aur cental hissa ke unite kar ke Gupta Empire banaa jon ki 200 saal talak chalaa. Ii time Hinduism aur aage barrha. South India me Chalukyas, Cholas, Pallavas, aur Pandyas raj karat rahin jon ki Hinduism aur Buddhism ke Asia ke dusra des me export karin. South India me, Kerala 77 CE se Roman Empire se trade karat rahaa. Islam bhi pahile Kerala me Muslim traders se aais. Muslim rule subcontinent me 712 CE me aais jab ki Arab general Muhammad bin Qasim Sindh aur Multan pr kapjaa karis. Iske baad dher aur Muslim invaders central Asia se aain aur Delhi Sultanate aur Mughal Empire jaise Empire ke suruu karin. Mughal Empire ke saathe dher Rajput kingdoms, aur dher Hindu states, jaise ki Vijayanagara Empire, Maratha Empire, aur Ahom Kingdom bhi rahaa. 18th century me Moghul Empire Afghans, Balochis, Sikhs, aur Marathas ke kaaran kamjor hoe gais. .
Mid-18th century ke baad, India ke dhire dhire British East India Company aapan niche kar liis. Company ke raaj se nakhusi ke kaaran Indian Rebellion of 1857 bhais aur iske baad , India ke was directly British Crown ke niche karaa gais. Iske baad struggle for independence ke Indian National Congress suru karis jiske baad me Muslim League bhi join karis. Subcontinent ke United Kingdom se 1947 me ajaadi mila aur des ke partition kar ke India aur Pakistan banawa gais. * Interim - It is debatable whether Mr. Gulzari Lal Nanda was a Prime Minister or an Acting Prime Minister. The constitution does not have a position of acting Prime Minister. Mr. Nanda was sworn in as the Prime Minister of India. In contrast, the constitution provides for an acting President who discharges the duties of a President. Hence, constitutional experts and historians now agree that Mr. Nanda is the second Prime Minister of India. Ii suchi ke number karaa gais hae uu order pe jispe uu logan presential election ke jitin rahaa. Varahagiri Venkata Giri, Muhammad Hidayatullah, aur Basappa Danappa Jatti, acting president rahin, aur ii kaaran se number nai karaa gais hae. India ke President koi party ke member nai rahe hae aur Political party waala column ii dekhae hae ki president elect hoe se pahile kon party me rahaa. 1 Dr Rajendra Prasad 100px 26 January 1950 13 May 1962 Dr.S Radhakrishnan Prasad, ajaad India ke pahila President rahaa aur Bihar ke rahaa. Uu India ke ajaadi ke larai me bhi involved rahaa. Prasad, ekke President rahaa jon ki dui dafe President banaa. 13 May 1962 13 May 1967 Zakir Hussain Radhakrishnan was a prominent philosopher, writer, a Knight of the Realm and also held the position of vice chancellor of the Andhra University and Banaras Hindu University. He was also made a Knight of the Golden Army of Angels by Pope Paul VI. 3 Zakir Hussain 13 May 1967 3 May 1969 Varahagiri Venkata Giri Hussain was vice chancellor of the Aligarh Muslim University and a recipient of Padma Vibhushan and Bharat Ratna. He died before his term of office was ended. Varahagiri Venkata Giri * 3 May 1969 20 July 1969 Giri was appointed as acting president following the death of Hussain. He resigned in a few months to take part in the presidential elections. Muhammad Hidayatullah * 70px 20 July 1969 24 August 1969 Hidayatullah served as the Chief Justice of India, and was a recipient of the Order of the British Empire. He served as acting president until the election of Giri as the President of India. 4 Varahagiri Venkata Giri 24 August 1969 24 August 1974 Gopal Swarup Pathak Giri is the only person to have served as both an acting president and president of India. He was a recipient of the Bharat Ratna, and has functioned as Indian Minister of Labour and High Commissioner to Ceylon (Sri Lanka). 5 Fakhruddin Ali Ahmed 100px 24 August 1974 11 February 1977 Basappa Danappa Jatti Fakhruddin Ali Ahmed served as a Minister before being elected as president. He died in 1977 before his term of office ended, and was the second Indian president to have died during a term of office. Basappa Danappa Jatti * 100px 11 February 1977 25 July 1977 Jatti was the vice president of India during Ahmed's term of office, and was sworn in as acting president upon Ahmed's death. He earlier functioned as the Chief Minister for the State of Mysore. 25 July 1977 25 July 1982 Muhammad Hidayatullah N.S.Reddy was the first Chief Minister of Andhra Pradesh State. Reddy was the only Member of Parliament from the Janata Party to get elected from Andhra Pradesh. He was unanimously elected Speaker of the Lok Sabha on 26 March 1977 and relinquished this office on 13 July 1977 to become the 6th President of India. In March 1972, Singh assumed the position of chief Minister of Punjab, and in 1980, he became Union Home Minister. 25 July 1987 25 July 1992 Shankar Dayal Sharma In 1942, Venkataraman was jailed by the British for his involvement in the India's independence movement. After his release, he was elected to independent India’s Provisional Parliament as a member of the Congress Party in 1950 and eventually joined the central government, where he first served as Minister of Finance and Industry and later as Minister of Defence. 9 Shankar Dayal Sharma 25 July 1992 25 July 1997 Kocheril Raman Narayanan Sharma was Chief Minister of Madhya Pradesh, and the Indian Minister for Communications. He has also served as the governor of Andhra Pradesh, Punjab and Maharashtra. Narayanan served as India's ambassador to Thailand, Turkey, China and United States of America. He received doctorates in Science and Law and was also a chancellor in several universities. He was also the vice-chancellor of Jawaharlal Nehru University. 25 July 2002 25 July 2007 Bhairon Singh Shekhawat Kalam, was a scientist who played a leading role in the development of India's ballistic missile and nuclear weapons programs. Kalam also received the Bharat Ratna. 25 July 2007 Incumbent Mohammad Hamid Ansari Patil is the first woman to become the President of India. She was also the first female Governor of Rajasthan. Symbol (*) light brown backgroundke saathe, ii dekhae hae ki iiacting president rahaa. 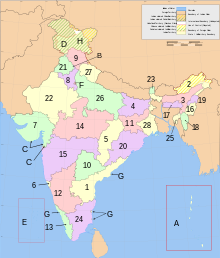 India me 29 states aur 7 union territories hae (jisme national capital territory bhi hae). Union territories ke President of India se appoint karaa gais administrators chalawe hae. Dui territor, (Delhi aur Puducherry) ke partial statehood dewa gais hae, jisme ek elected legislature aur executive councils of ministers hae, lekin state e raam ii logan ke lage puura taagat nai hae. ↑ "History in Chronological Order". Government of Pakistan. Retrieved 2008-01-09. ↑ "Pakistan". Library of Congress. Retrieved 2008-01-09. ↑ "Dr. Rajendra Prasad". The Hindu. 7 May 1952. Retrieved 30 November 2008. ↑ "Republic Day", Time, 6 February 1950. Retrieved on 30 November 2008. ↑ "Rajendra Prasad's birth anniversary celebrated". The Hindu. 10 December 2006. Retrieved 30 November 2008. ↑ Harish Khare (6 December 2006). "Selecting the next Rashtrapati". The Hindu. Retrieved 30 November 2008. ↑ Ramachandra Guha (15 April 2006). "Why Amartya Sen should become the next president of India". The Telegraph. Retrieved 30 November 2008. ↑ "Dr S. Radhakrishnan". The Sunday Tribune. 30 January 2000. Retrieved 30 November 2008. ↑ "Zakir Husain, Dr". Vice President's Secretariat. Retrieved 30 November 2008. ↑ "Shekhawat need not compare himself to Giri: Shashi Bhushan". The Hindu. 12 July 2007. Retrieved 30 November 2008. ↑ "Hidayatullah, Shri M". Vice President's Secretariat. Retrieved 30 November 2008. ↑ "Giri, Shri Varahagiri Venkata". Vice President's Secretariat. Retrieved 30 November 2008. ↑ 14.0 14.1 "Gallery of Indian Presidents". Press Information Bureau of the Government of India. Retrieved 30 November 2008. ↑ "Jatti, Shri Basappa Danappa". Vice President's Secretariat. Retrieved 30 November 2008. ↑ Bhargava, G.S.. "Making of the Prez - Congress chief selects PM as well as President", The Tribune. Retrieved on 6 January 2009. ↑ Wolpert, Stanley A. (1999). "India". University of California Press. p. 217. Retrieved 3 January 2009. ↑ Hazarika, Sanjoy. "Man In The News; India's Mild New President: Ramaswamy Venkataraman", The New York Times, 17 July 1987. Retrieved on 6 January 2009. ↑ "Venkataraman, Shri R." Vice President's Secretariat. Retrieved 6 January 2009. ↑ Navtej Sarna (27 December 1999). "Former President Dr. Shankar Dayal Sharma passes away". Embassy of India, Washington D.C. Retrieved 6 December 2008. ↑ "Narayanan, Shri K, R". Vice President's Secretariat. Retrieved 6 December 2008. ↑ "The BJP's aim was to get rid of me". Confederation of Human Rights Organizations. Retrieved 6 January 2009. ↑ Ramana, M. V.; Reddy, C. Rammanohar (2002). Prisoners of the Nuclear Dream. New Delhi: Orient Longman. p. 169. http://books.google.com/books?id=IjZA-bQde1wC&pg=RA1-PA169&dq=%22Abdul+Kalam%22+%22%22Pokhran-II%22&ei=R6niSOzbDI3gtgPx0tiOBw&sig=ACfU3U0vTUY4GkXlltbzgECN98hWD8A6zQ. ↑ Emily Wax. "Female President Elected in India", The Washington Post, 22 July 2007. Retrieved on 2 December 2008. ↑ "Pratibha Patil is Rajasthan's first woman governor". Express India. 8 November 2008. Retrieved 6 December 2008.